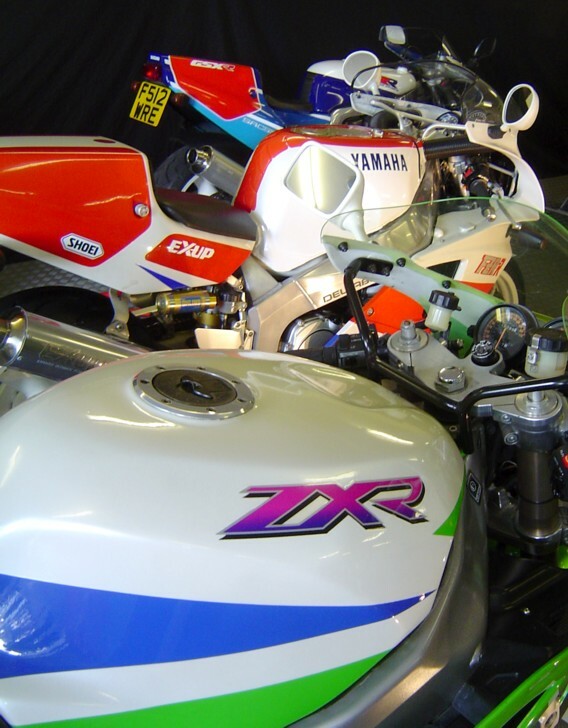 Two strokes ? Been there, done that, move on. No, only joking, but for this show we did something away from the norm. 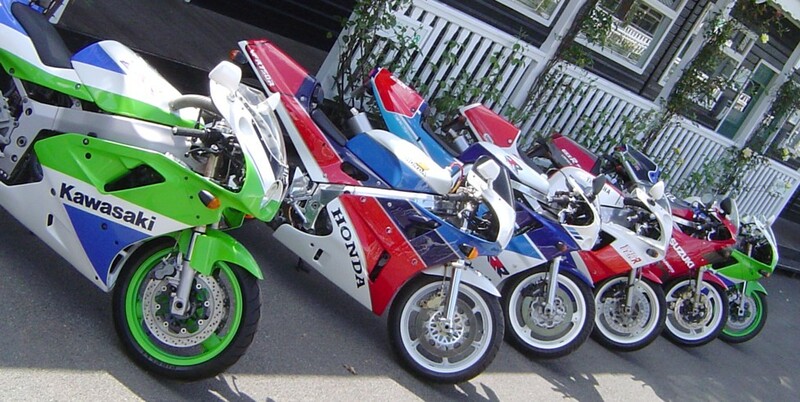 The whole reason for starting Diff'rent Strokers in the first place was us wanting to see displays of certain bikes that no-one else ever seemed to do. 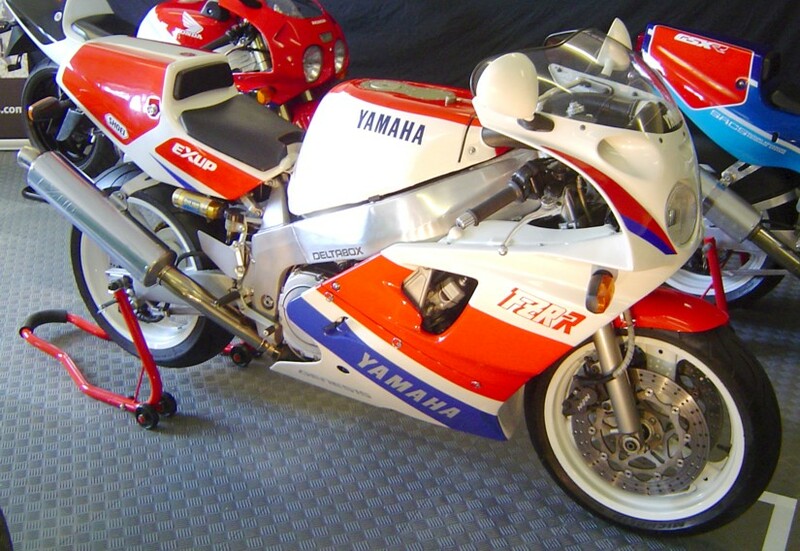 The RC30 Owners Club always put on a cracking display of VFR/RVF750R's but what about the other homologation specials ? Even when the magazines feature them they only manage to put three together. We thought we could do better. 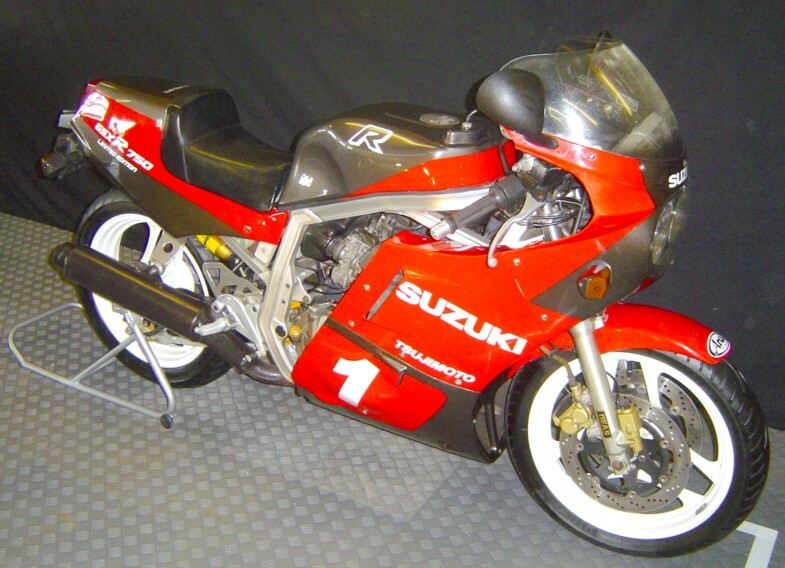 The Suzuki's are probably the hardest to find and least-often seen but that was easy - Tim owns a '89 GSX-R750RK and Darin has one of the '86 GSX-R750 Ltd's in original Yoshimura Japan colours complete with dry clutch, flatslide carbs and electronic anti-dive. We'd discussed our idea with Chris from the RC30 Club at one of the shows last year and he said he'd be keen to get involved. 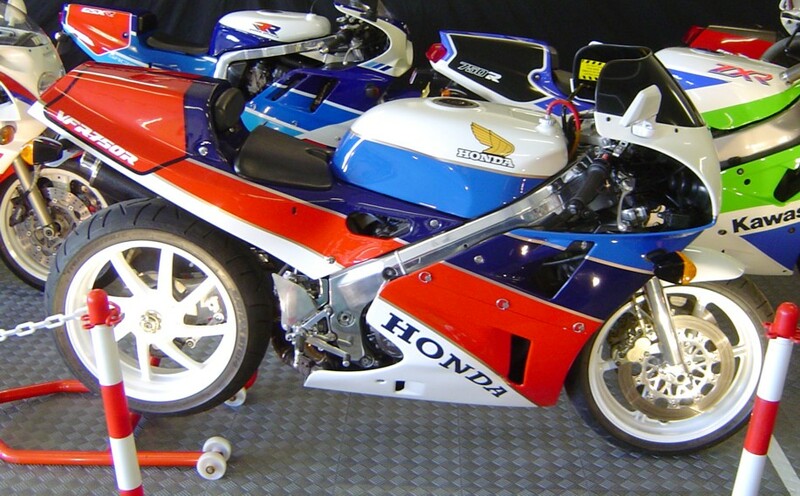 He offered us his RC45 and put us in touch with Rob B who was willing to bring his RC30 along too. 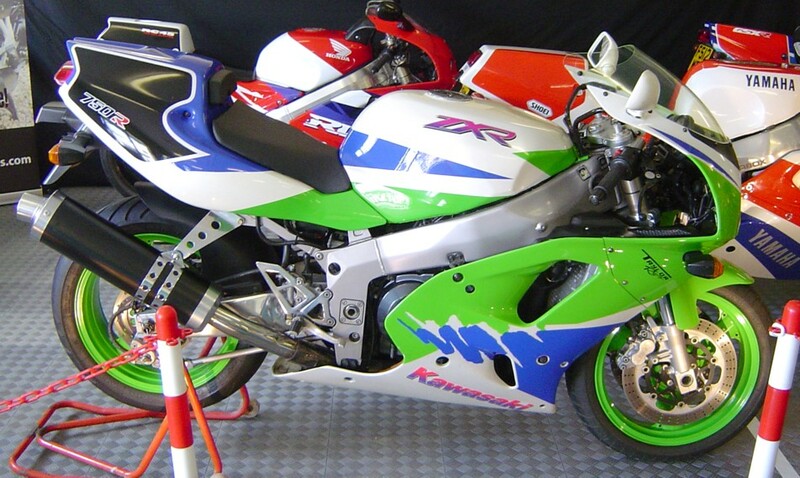 Rob E who'd generously brought bikes along to the last two shows had recently bought a mint ZXR750R-K1 and we were offered a ZXR750R-M1 very early on by someone on one of the other forums. Sadly this didn't work out in the end, but after a mild panic it was discovered that Chris owns one of those too. 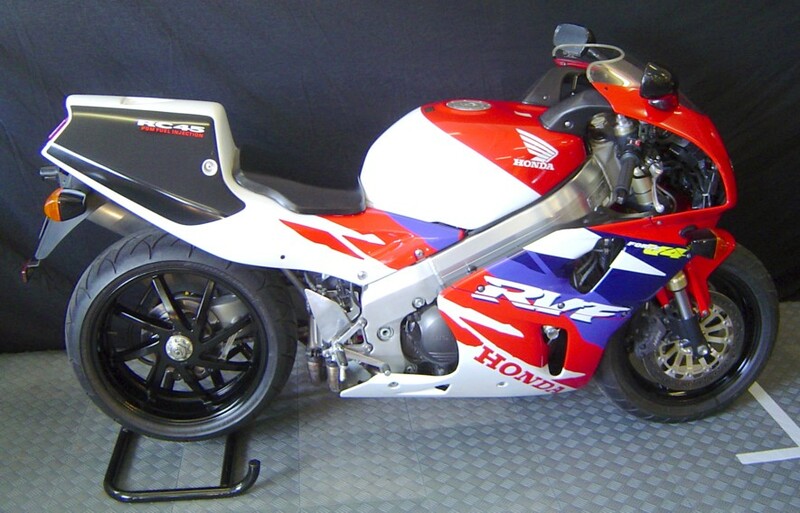 We thought we'd struggle to find an OW01 but this problem was solved early on when Darin bought one ! We wanted an R7 to complete the set but there's not many out there and they're all tucked away safe. We tracked one down and at one point it was pencilled in to come but it was then sold on and never appeared in the end. 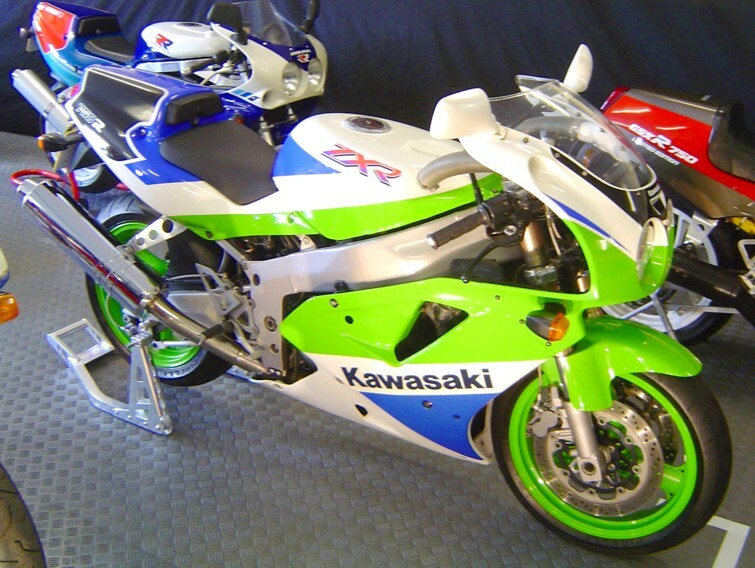 Of course, during the show we spoke to someone who turned out to own one and would have been willing to lend it to us - doh ! 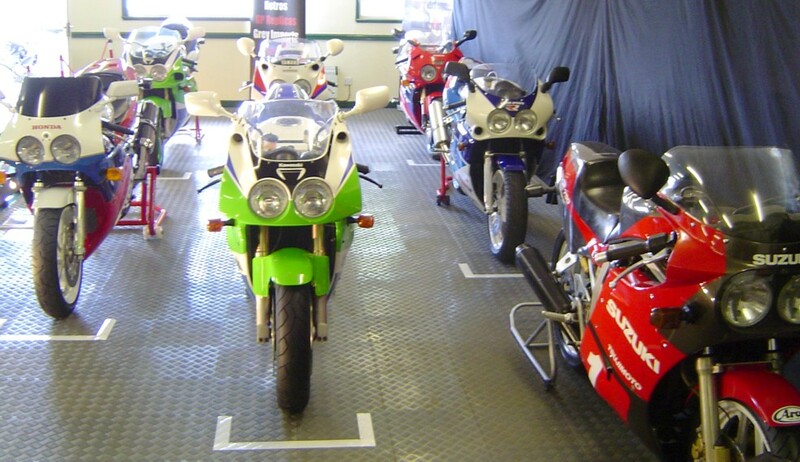 In the Paddock Pavilion once more, we found the addition of an extra club had diminished our stand space a bit, but with Rob E's idea of lining the bikes up as if on a starting grid it looked great. The usual backdrop, banners and lights were deployed and we had a table at one end with the new innovation for this show : a screen showing a slideshow of the bikes on display plus other info and pictures explaining the club and how to get involved. Having completed set-up, we headed off to see the rest of the show and scour the autojumble for rare parts (no chance). Reactions to the bikes were mixed. 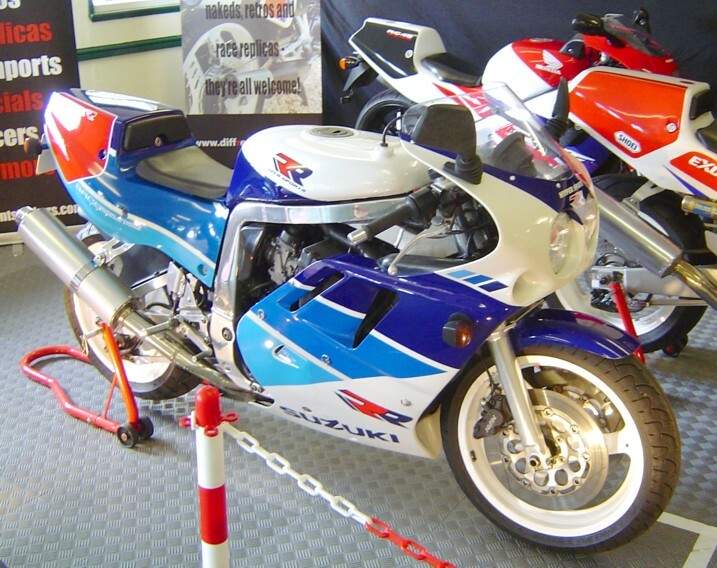 An RC30 always attracts people of course and quite a few people understood the significance of the display and what all the bikes were. But we also got the impression that a lot of people didn't know exactly what they were looking at and dismissed us as just a handful of 'modern plastic' bikes. Very few people bothered to view the slideshow. Having won awards for the stand for the last two years, this time our only recognition was a Highly Commended rosette for the OW01. Mick Grant was the guest of honour for the show, and on Saturday afternoon he wheeled his KR750 race bike out in the sun and fired it up for the crowd. 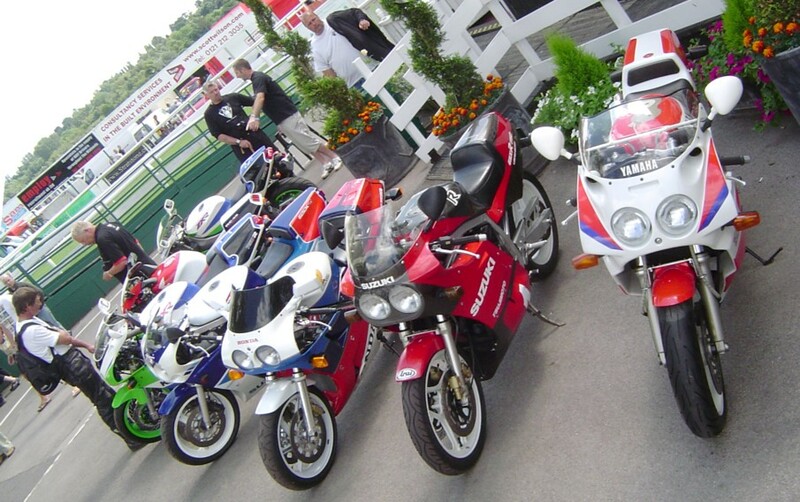 As in previous years, an eclectic assortment of noisy bikes were rounded up and the proud owners interviewed over the tannoy. Because this happens right outside the pavilion, it has the benefit of bringing the public back, especially those who had missed us out on the way in, deeply focussed on the search for a points cover for a 1937 Francis Barnett. 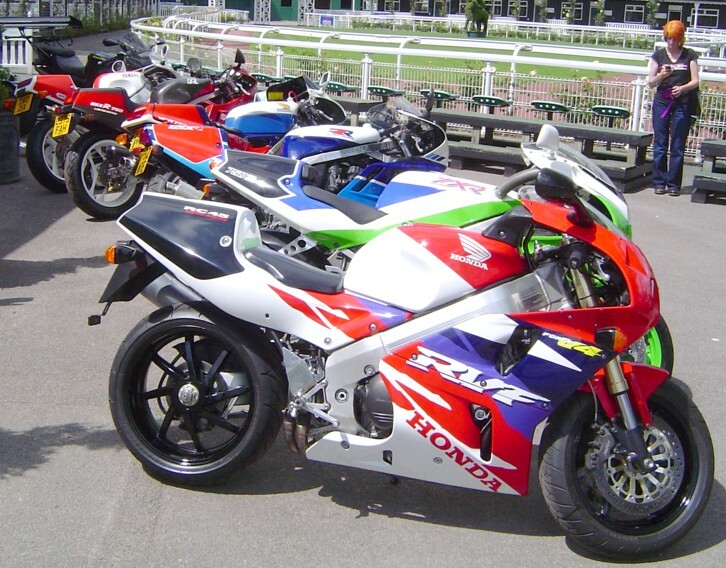 When the 'sound-off' thing happened again on Sunday, we were asked if we could supply some bikes to take part. Having embarrassed himself a couple of years earlier with his TZR, Tim rapidly nominated Rob B to take the RC30 out and then ran off to hide. 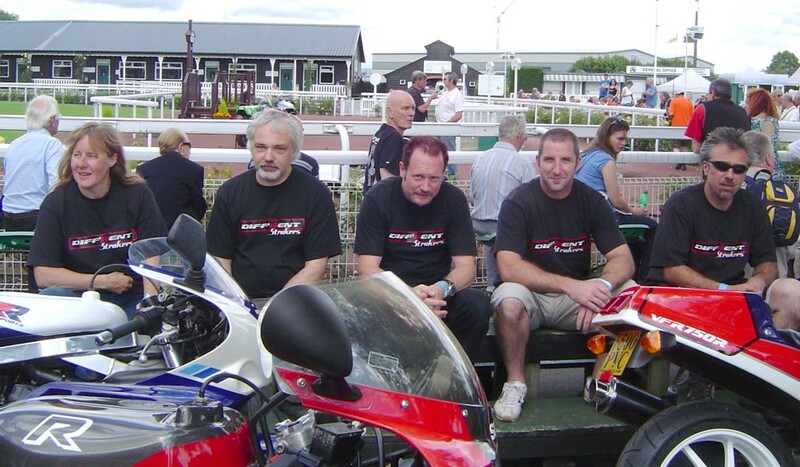 Rob E said he'd demo his ZXR too, quickly followed by Darin on the '86 GSX-R. Chris was feeling a bit ill but his other half Victoria leapt at the chance to show off the RC45 and of course Tim then felt left out and wheeled his RR down the ramp too. 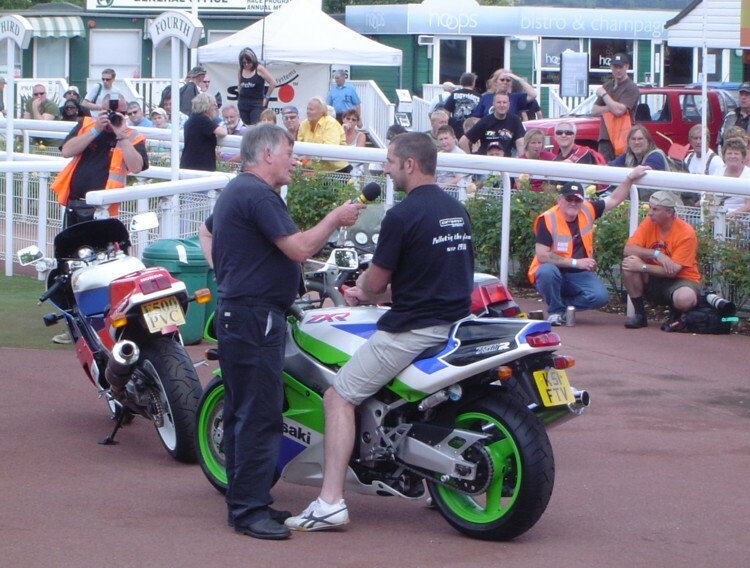 Everyone was interviewed separately on the mic before we all fired the bikes up and did a slow lap of the parade ring. 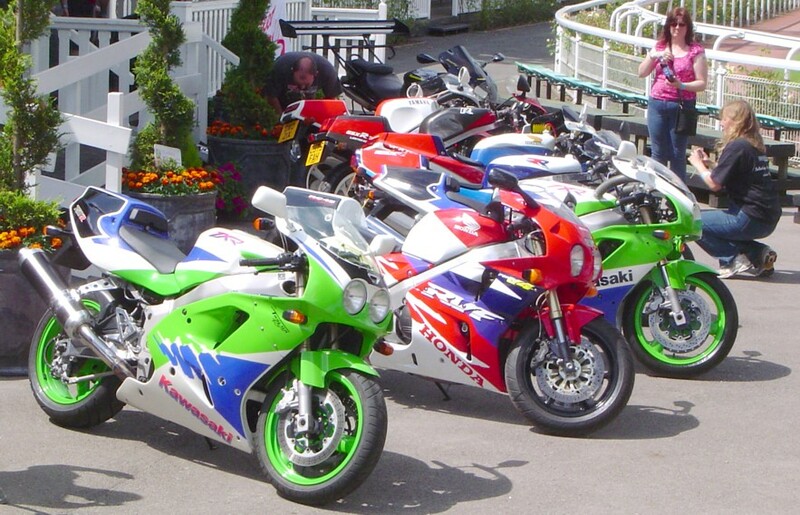 Darin parked the Suzuki up outside the pavilion and the rest of the bikes joined it. This drew a crowd so the other two were brought out too and the seven looked fantastic together in the sun. So good in fact that we dismantled the now-empty stand and packed it all away, leaving the bikes outside where they could be appreciated. Grateful thanks are due to Chris, Victoria, Rob B and Rob E for bringing their stunning bikes along and for making the weekend very enjoyable once again. We'll definitely be returning to this theme sometime in the future.